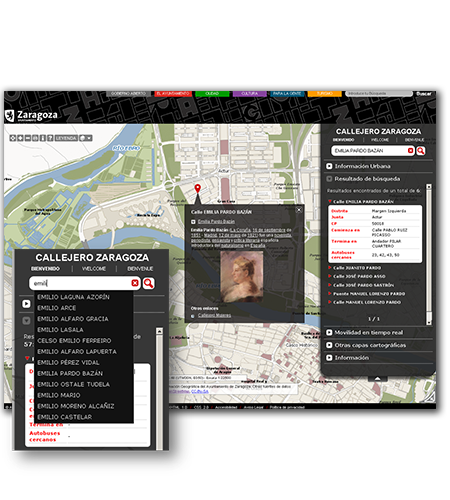 Street map of Zaragoza provided by the City Council that allows users to get the location of any street of the city and provides integrated information of the city incorporating data coming from other administrations. It is accessible from any kind of device and offers remarkable improvements in usability. Search of streets with access to detailed information of each street (where it starts and where ends, district, post code, etc.) It offers predictive search to facilitate location of the streets. It allows visualization of urban information in any thematic scope (mobility, tourism, culture, etc. ), showing information over the map and providing access to the page containing detailed information of the resource. 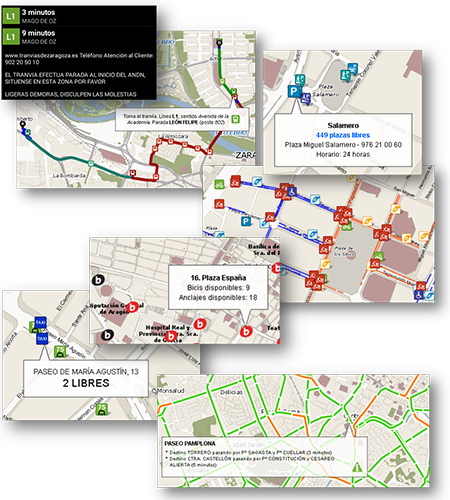 It offers extended information of the city integrating data from other administrations thanks to the use of standards that guarantee interoperability. From the section “Other cartographic layers” users can access to data coming from Cadastre, Cartociudad, SITAR, IGN, etc. that widen and complete municipal information. It discovers the history of city streets by means of semantic link with Wikipedia. For example, we can know who “Emilia Pardo Bazán” was or what happened during “Los Sitios” of Zaragoza. 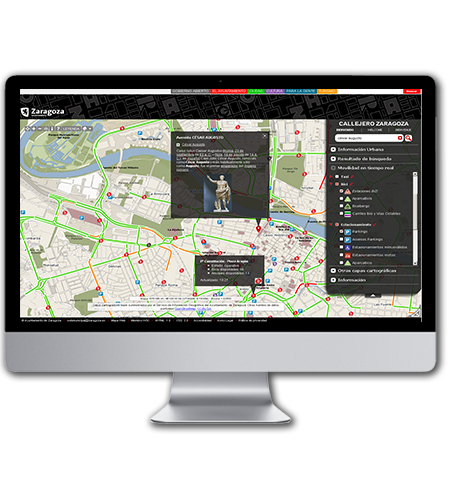 It integrates real time information providing a dynamic view of the city. That facilitates interaction of citizens with the urban environment: delay of public transport, free space at parking areas, available bicycles at biZi stations, etc. 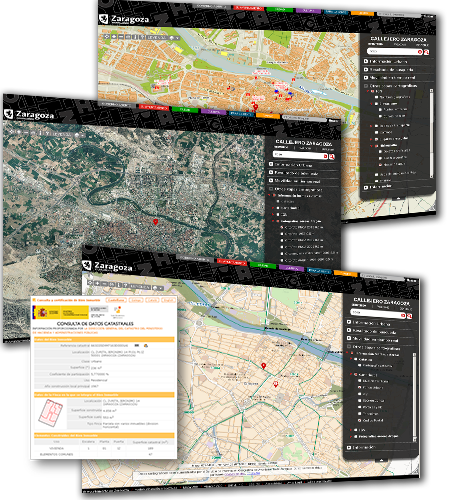 It is possible to get additional information of any point of the city. Only with one click on the map users can get information from cadastre, census section, uses of the land and many other aspects of interest. 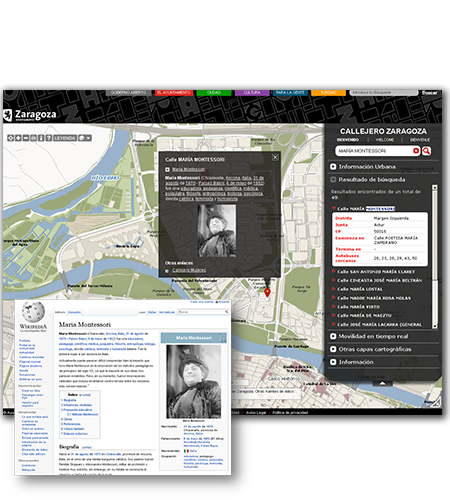 It also offers major advances in usability as responsive design, which makes it accessible from any mobile device, or progressive zoom to improve interaction with cartographic information.